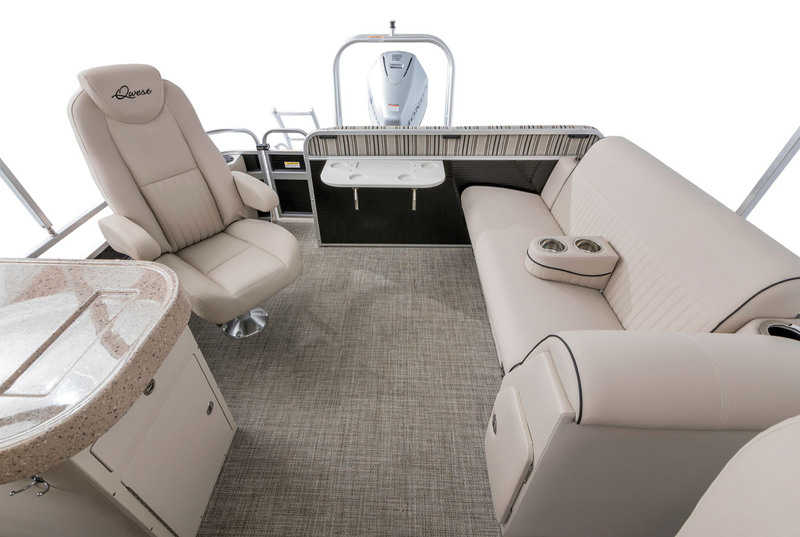 The Avanti 823 Lanai DS Bar pushes the luxury bar for compact pontoons even higher. Early compact pontoons from a certain company that brought us “barges” were the very definition of spartan. The goal was to hit a low nationally advertised price that anyone could afford, and it was obviously a successful strategy. 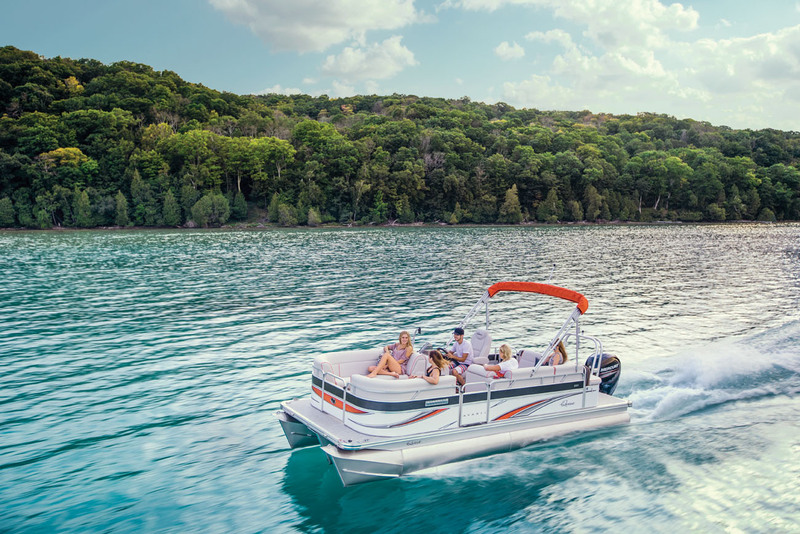 Once pontooners got a taste of the lifestyle and the versatility of these tubed wonders, however, they wanted more, and that’s where Qwest Pontoons comes in. Qwest management quickly discovered luxury sells and started building its smaller boats with more upscale amenities, which became its niche in a very competitive segment. Its LS (Luxury Series) models became huge sellers, and even though the standard models are pretty plush, the sales team noticed most of its boats were rolling out of the factory in St. Louis, Mich., maxed with options. That observation led to the next evolution of the Qwest family: the Avanti Series, whose models are the builder’s most extensively equipped pontoons ever, with even more high-end finishes and longer lengths. Stepping aboard the Avanti Lanai 823, I immediately noticed the upscale seating. The settees have high backs for comfort and contrasting pinstripes for good looks. The upholstery has a unique, linen-like texture that feels great, and its surface diffuses the sun’s rays, so it stays cooler on blazing hot days like we had for our test. Called Comfort Touch, the 33-ounce expanded vinyl undergoes an embossing process that gives it its unique appearance and its sun-diffusing quality. The upholstery comes in tan or light gray and features pleated panels for textural contrast. On the rear deck, which Qwest calls its social platform, is an aft-facing bench that features striking striped Sunbrella upholstery, to better weather the elements. The rear deck is huge and not just an overhang, which is how some other builders do it; it’s fully supported by the tubes. Although Qwest builds many dedicated fishing models, such as the Pro Troll series, the Avanti’s rear-deck setup is a good one for fishing, especially on the three Fishtail models, which include two stern fishing chairs and a large rigging station in between that has cupholders, vertical rod racks, rod holders for trolling and a large working surface that does double duty as a place to present food. Our test boat featured the Gen II Triple Tube (TT) setup, which includes three 24-inch tubes that all have lifting strakes on both sides. The TT option ($5,064) means owners can power this 23-footer with up to 175 hp, but our test boat featured the Honda BF150, which has many of the same high-performance features as its flagship model, the BF250. Honda bases many of its outboard designs on its car engines, and the BF150’s 2.4L four-cylinder dual-overhead block is the marinized version of the engine in its Accord and CRV models, so it has billions of miles of real-world experience under its belt. Pushed by the Honda and aided by the lifting power of its six strakes, the Avanti 823 Lanai got on plane in 2.9 seconds. The Honda BF150 features Variable Valve Timing and Lift Electronic Timing (VTEC), which ensures power that comes on strong and acceleration that’s smooth throughout its power curve, as evidenced by the Qwest’s time to 30 mph of 7.8 seconds. Top speed for the 2,650-pound boat was 37 mph. The Avanti features a new fiberglass helm design that has three flat surfaces for mounting items such as the standard Humminbird Helix 5 fishfinder/GPS display front and center and a standard Infinity Bluetooth stereo controller to the right, to operate a six-speaker stereo that includes a subwoofer. The captain even has a refrigerated cupholder with an on/off switch to conserve battery power. Some observers might question Qwest’s use of tubes smaller than the usual 25-inchers, but for its pontoons, tubes that size would be a bit of overkill. The seats are built in house and are constructed with Dura-Lite bases and an Ultra Flow seat ventilation system to keep biology experiments from forming. Given its light weight and its narrow 8-foot beam, the Avanti has plenty of flotation. The Gen II TT setup, with six lifting strakes, rides high in the water and easily supports the maximum 12 passengers it’s rated for. To reduce spray and prevent submarining when crossing large boat wakes, oversize nosecone caps are used at the bow. Its six-strake setup gives the tubes a wider footprint, which keeps the boat more stable and less prone to rocking in beam-sea conditions, and reduces the speed necessary to keep it on plane (14.9 mph), which is a handy trait when towing small kids on tubes. With strakes on the outside of the outboard tubes, it corners very flat and hooks up well. The large number of floorplans makes it easy to find the right model for a buyer’s particular lifestyle, and the DS Bar setup is ideal for both entertaining and for watersports. The TT tube package includes a sturdy dual-tube ski tow bar that sits high above the Honda. 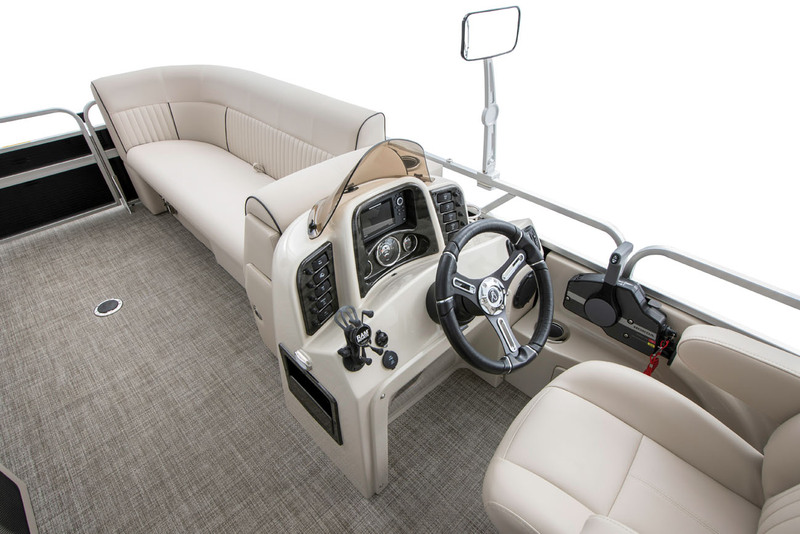 The rear captain’s chair and aft-facing recliner to port make ideal ski spotter seats, and the driver has a large rearview mirror that’s part of the TT package. An aluminum underskin and hydraulic steering also come with the TT package. There’s no in-floor ski storage locker, which preserves the clean look of the optional faux gray teak flooring. Don’t look for carpeting, because Qwest doesn’t offer it. Instead, standard flooring is a vinyl weave. The large rear deck has plenty of room for sports staging and a curved boarding ladder for extra easy reentry. Our test boat featured the DS Bar floorplan, which is one of nine offered. Just behind the high-back captain’s chair is a bar that features cupholders and a large working surface for drink and snack assembly and presentation. In the drawer is a knife holder to reduce cutlery rattle, and there’s a pull-out cutting board. Underneath resides a padded cooler customized with the Qwest name. At the stern is a flip-up table for more hors d’oeuvre display space. There’s a matching captain’s chair for additional seating around the bar, and to port is a comfortable recliner sofa with yet a third captain’s chair opposite the helm. Because the Avanti comes totally loaded, there are only a few options to consider. Owners who enjoy some shade are in luck, thanks to a rear Bimini extension ($434) and a forward Bimini ($582). Qwest incorporates an easy-to-use quick-release mechanism on its Bimini tops. For nighttime excursions, the $579 lighting package includes LED lighting beneath the outer deck and two underwater lights. Interior lighting and dock lights are standard. There’s a playpen mooring cover for $964. 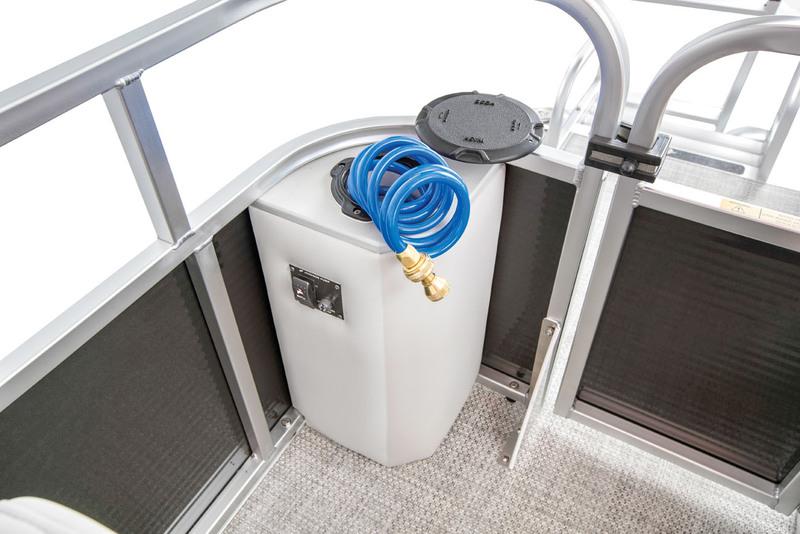 A trailer option is available from Qwest dealers. One option that will be a hit is the LilliPad diving boat, which will easily install on the swim platform and provide endless hours of kid fun. Its clever design doesn’t transmit the force of the dive to the boat itself, and it’s easy to detach when not in use. 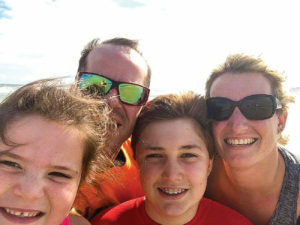 Purchased by Jeff and Laura Pike, plus Logan, 12, and Summer, 7, New Germany, Minn. Purchased at Foster Bros. Marine, Delano, Minn.
We wish it had a centerline storage area for skis and jackets. We previously had an old pontoon with a 25 hp outboard and liked being out on the water, but its performance made it impossible to do more than just idle around. We wanted to upgrade to a tri-toon with a larger motor so we could do things like take the kids skiing and tubing. We were really impressed with the huge list of standard features that were options on other pontoon brands. We do most of our boating on Lake Minnetonka and Lake Waconia, and we like to cruise around and entertain. Thanks to the standard GPS/fishfinder and rear bench seat, it’s a great boat for fishing for walleye and crappie. On Minnetonka, there’s a sandbar near Big Island where we hang out with other boaters. We like to go to restaurants such as Maynards and Lord Fletcher’s Old Lake Lodge. Our buying experience at Foster Bros. was outstanding. Mark Foster really went out of his way to take great care of us. After the sale, he gave us some great tips on trailering and driving the boat. When we have any questions, we just call him and he is happy to help us.